the philadelphia museum of art is holding its first retrospective exhibition of the small scale objects and furniture pieces created by london-based zaha hadid architects throughout the course of her career. 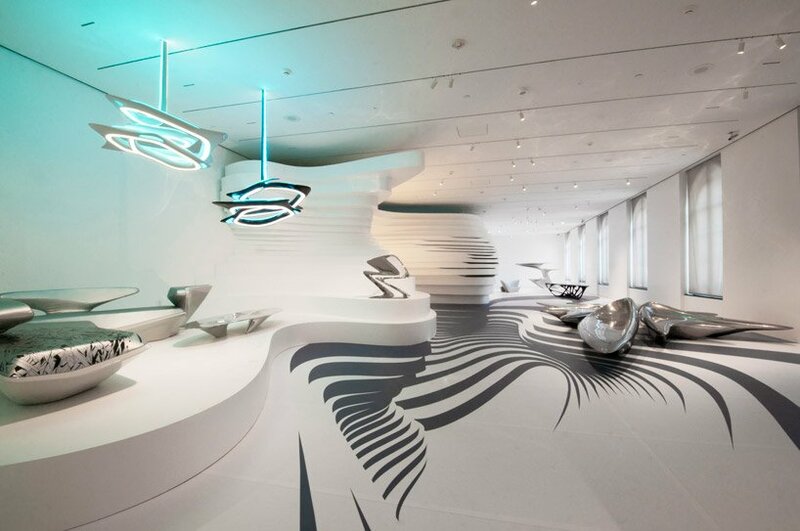 made out of polystyrene and vinyl graphics, it immerses visitors in the essence of hadid’s creations as it mirrors the forms and curvatures often found in her work. to expand the height of the perelman building, perspective lines were placed on the ground, giving the illusion of depth and assisting the flow through the space. the works on display include everything from clothing and jewelry to furniture pieces and lights, all designed by the architect herself. I found the mesa tables and light lamps very intriguing. The chairs do not reflect their purpose of being a comfort, they look quite the opposite. As per the clothing, i do not see zaha hadid’s attempt any where near successful. Also, the exhibition itself is really designed to speak about the “motion” concept which makes the displayed items less dominant.